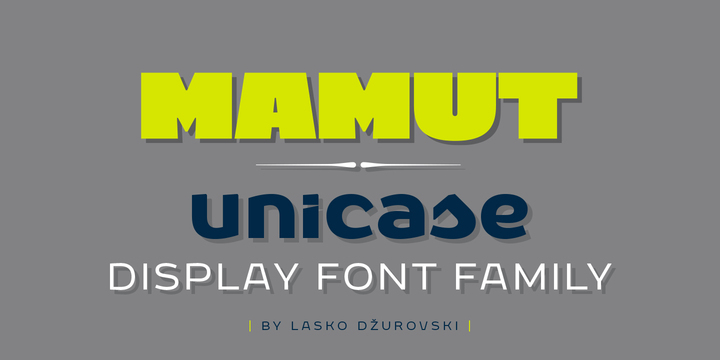 Mamut is a display typeface created by Lasko Dzurovski and published by Totem which has three unicase weights (Regular, Medium, Fat), equipped with wide range of OpenType features (over 500 glyphs). It is ideal for playful typographic compositions, headline, poster, magazine etc. Typographic ligatures can be used as a form of modern art. Ride the Mamut! A font description published on Friday, July 31st, 2015 in Fonts, Lasko Dzurovski, Totem by Alexandra that has 2,890 views.